You don't have to be a Star Wars nerd to enjoy its poignant pursuit of virtue, feels Sukanya Verma. In its 40th year now, the Star Wars legacy is the most iconic outcome of George Lucas' vision of an intergalactic spectacle around good versus evil. But it's the moral dilemmas, familial discords and a host of memorable characters and creatures, their peculiar skills, sounds and traits that immortalises its legend and longevity. Inarguably the most recognised and revered brand in cinematic space, Star Wars bonds on an emotional level with its fans rendering the passing away of its characters in reel (Han Solo) or real life (Carrie Fisher) more personal than usual. As someone who grew up on this fond feeling, director Rian Johnson wields it to forward the saga while finding a solid balance between conservation and change. Like its prequel The Force Awakens, it has its moments of nostalgia but audacity not attachment towards the source is what fuels its path-breaking imagination. The Last Jedi, the VII episode in the series, is a visually sumptuous illustration of the galaxy far, far away that jumps into the heart of action without worrying about who's who whilst characters confront their ambiguity and antagonist head on. What ensues is startling, stirring and showy in the boldest way possible, it's like Star Wars reborn. But before it slips into its new, improved audacious skin, hectic space battles dominate the early bits of its 152-minutes long narrative. The bad guys are pulling all stops to upset the good guys. Led by the gaunt and horrible Snoke (CGI whiz Andy Serkis at the top of his game again) and his half-hearted accomplice Kylo Reno (Adam Driver), the First Order is in full offensive mode even as Princess Leia and the valiant but vulnerable Resistance -- Rey (Daisy Ridley), Finn (John Boyega), Poe (Oscar Isaac), new addition Rose (Kelly Marie Tran) and the endearing droids -- put up their best fight. The story soon splits into multiple arcs and cleverly intercuts between Rey meeting the legendary Luke Skywalker, her enigmatic, telepathic encounters with Kylo Ren, Finn and Rose's quest for a breakthrough and bumping into the sneaky hustler DJ (Benecio Del Toro), Poe's run-ins with the Resistance second-in-command (Laura Dern). Throw in a bunch of fanciful creatures -- crystal foxes and owl-eyed porgs alongside its robust performers and the epicness is everything you'd expect in a Star Wars show. 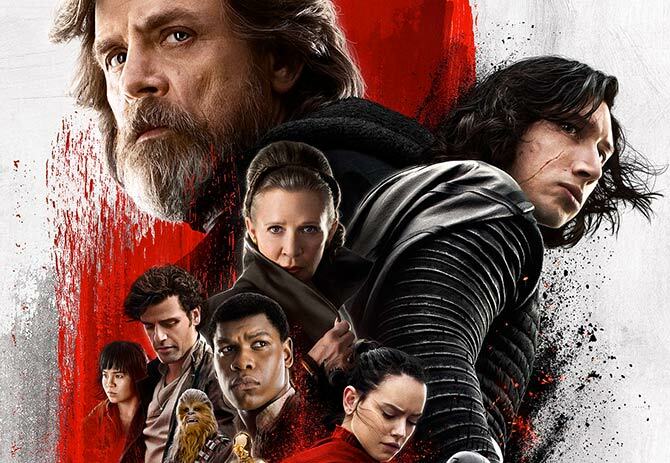 Except once its crescendo like pace gets going, The Last Jedi exceeds its promise of a tick-all-the-boxes blockbuster. Right when it becomes a meditation on the frailty of the human soul, its relentless inner war to resist demons and save souls. To kill goodness takes more than the might of a dazzling lightsabre or firing walkers. Its indestructibility is asserted in the most surreal and spiritual manner by the Skywalker siblings at crucial junctures of the story. You don't have to be a Star Wars nerd to enjoy its poignant pursuit of virtue.